Star Dental, innovator of the application of ceramic bearing technology to the dental industry with their patented Vortex ceramic bearing lube free turbine. 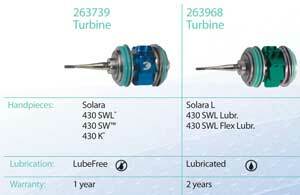 This US company carries a full line of lube free handpieces, both high speed and low speed. Also, one of the most highly sought after sonic scalers in the industry is produced by Star, the Star Titan Sonic Scaler. The Star 430 series high speed handpieces are strong stainless steel handpieces with good torque and small heads. Star quality with titanium materials, cellular optics, and more power (18 watts). Titan or BlisSonic. You can't go wrong with a company that helped pioneer the technology as it applies to dentistry. Variable speed, forward or reverse motor capable of speeds ranging from 100 to 20K rpm. Tons of attachments for this one make it one of the most versatile on the market. Nose Cone attachment rated for 20K RPM for use with doriot attachment heads and 3/32 burs. Excellent contra angle adaptor with multiple heads available from Star Dental and others. 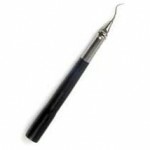 Excellent 4,000 RPM hygiene handpiece compatible with plastic or metal prophys.